It’s springtime at the Notch, and nothing illustrates the season better than the gushing waterfalls. 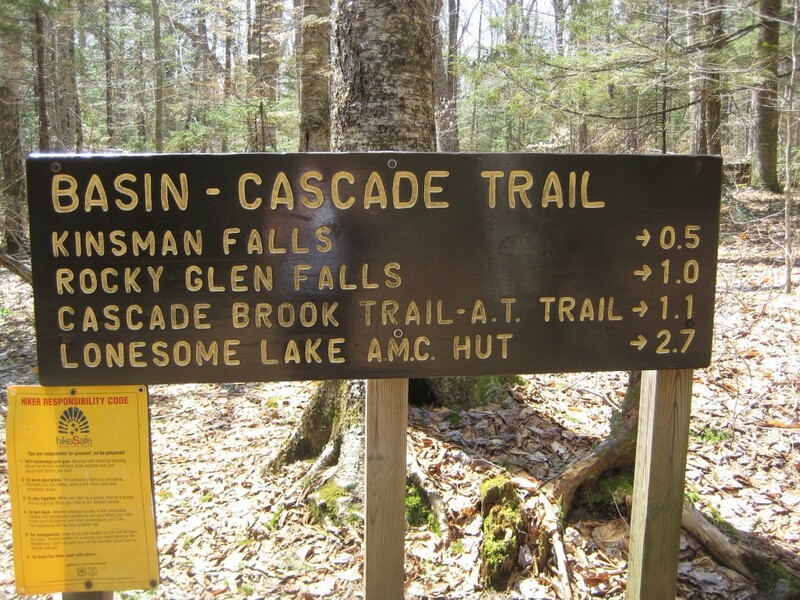 Today I set out for a hike up to Lonesome Lake via the Basin-Cascades trail and the Cascade Brook trail, eager to check out the sparkling cascades and waterfalls along the brook. 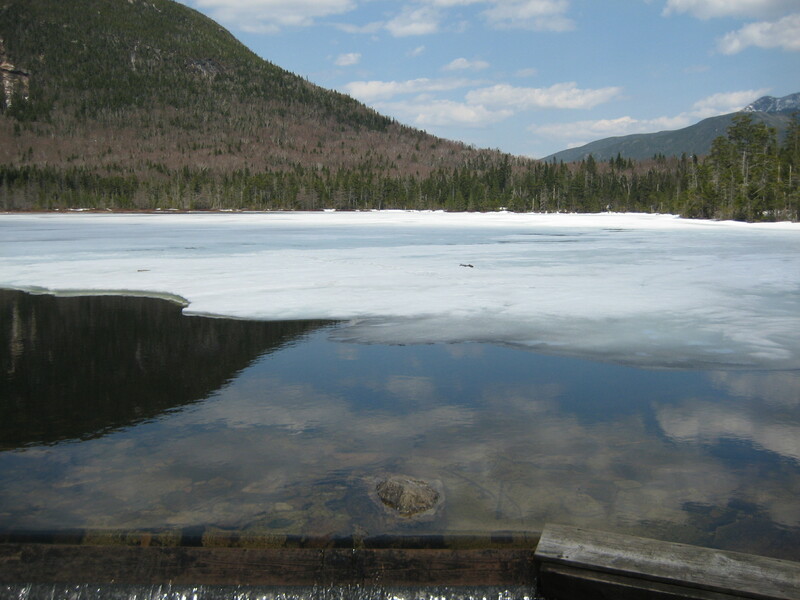 Lonesome Lake is a picturesque, 12.2 acre lake nestled beneath the high cliffs of Cannon Mountain, about 1000’ above Franconia Notch. 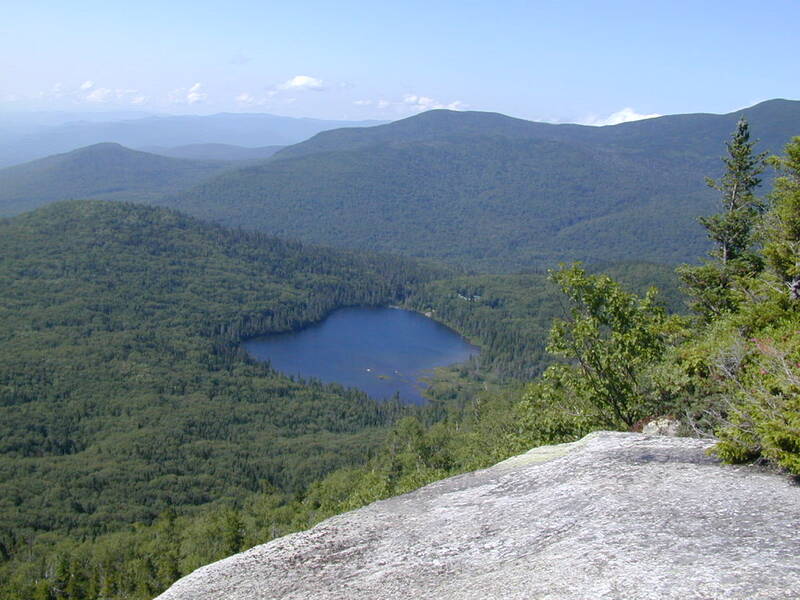 From the lake’s shores, you can catch stunning views of Franconia Ridge, visit the Lonesome Lake Appalachian Mountain Club hut, and jump in for a refreshing dip during hot summer hikes. The hike to Lonesome Lake from Franconia Notch is a perfect day hike on its own, or can be part of a larger hike over Kinsman Ridge (featuring Cannon Mountain, the Cannonballs, and North and South Kinsman) or an overnight at the AMC hut or the Kinsman Pond Shelter. GETTING THERE: From the Notch Hostel, I drove north up Rt. 93 about ten minutes before pulling off at the sign for The Basin parking lot. From the lot, I walked through the pedestrian tunnel under the highway and followed the path toward the Basin. My day started with a visit to the Basin, a large pothole in the Pemigewasset River. 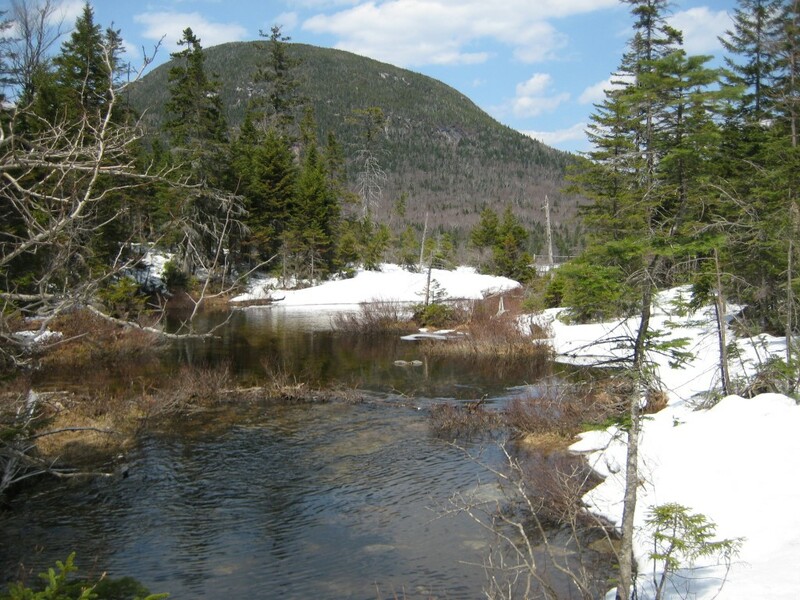 The Basin was scoured out by water, sand, and rocks flowing from the melting glacier that once filled Franconia Notch during the Ice Age. 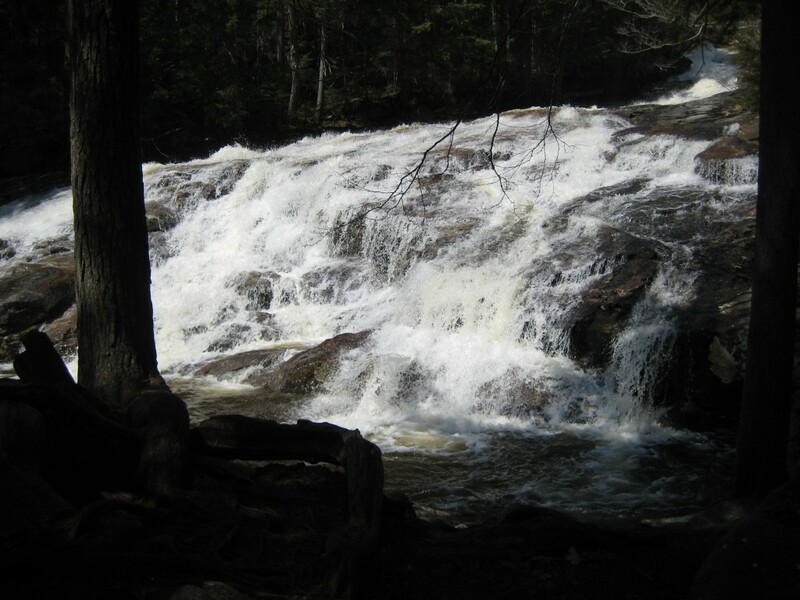 The Pemi River was in full force, living up to its name — “Pemigewasset” is an Abenaki Indian word meaning “swift.” The Pemi is part of the Merrimack River watershed. It eventually flows into the Merrimack River, which drains into the Atlantic Ocean at Newburyport, Massachusetts. I headed up the Basin-Cascade Trail, all of which runs alongside Cascade Brook. 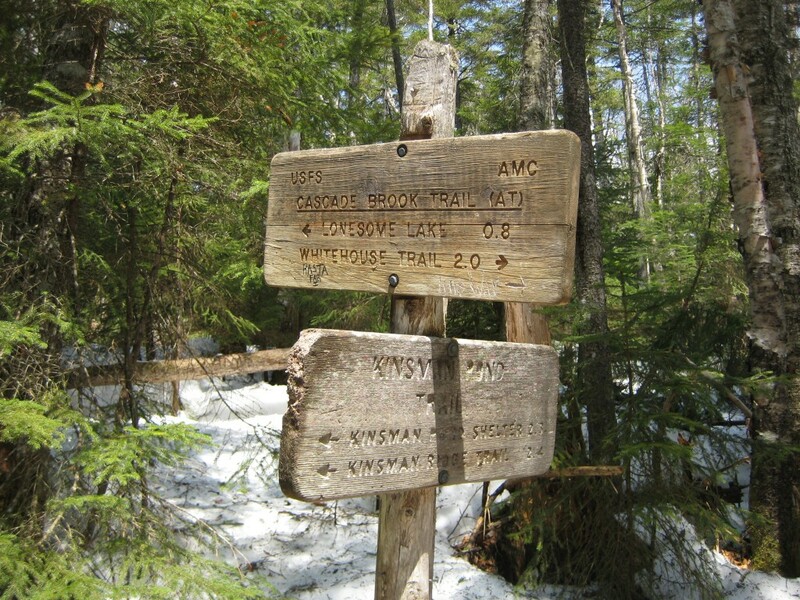 The Basin-Cascade trail sign is located about 50 yards from the Basin. For best views of Kinsman Falls, be sure to look for the unmarked trails that run to the bottom and top of the falls (they’re actually before the little sign for Kinsman Falls on the trail). 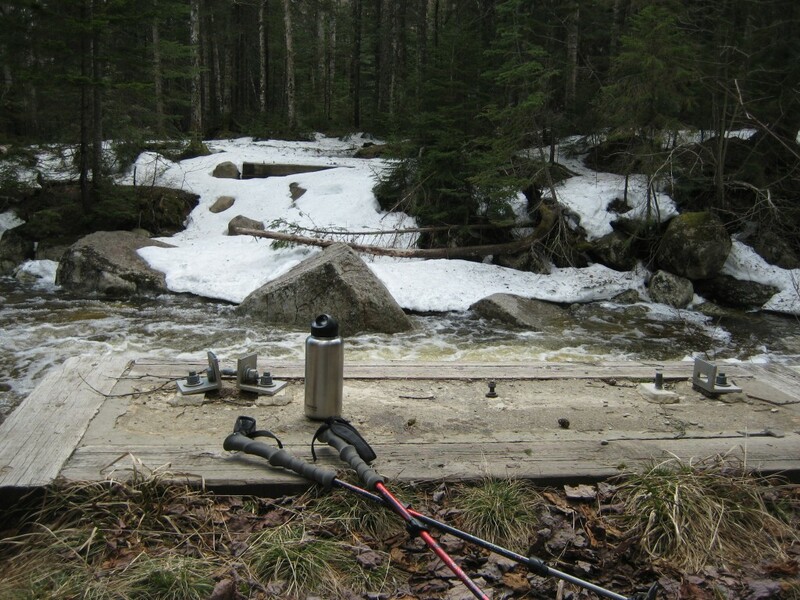 The trail normally crosses Cascade Brook after Kinsman Falls and continues along the south bank, but the water level was so high today that the water crossing was all but impossible. Several groups were turning back when I arrived, but I spotted a bushwhacked trail that continued along the northern bank, and decided to go for it. The trail eventually crosses back over to the northern side of the brook after Rocky Glen Falls, so I just stayed along the northern bank to avoid the two water crossings. 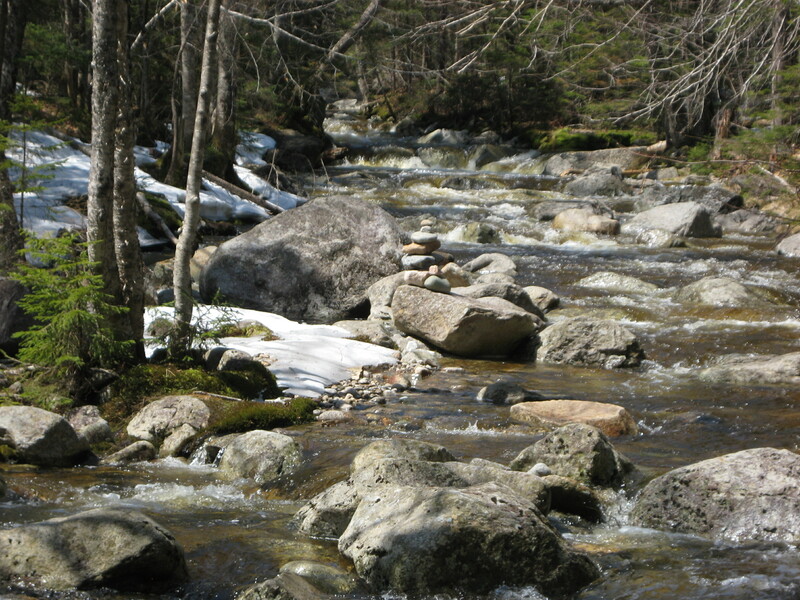 Cascade Brook. The official trail parallels the opposite (south) side of the brook. Cascade Brook is the outlet for Lonesome Lake, and flows directly into the Pemigewasset River near The Basin that I visited this morning. 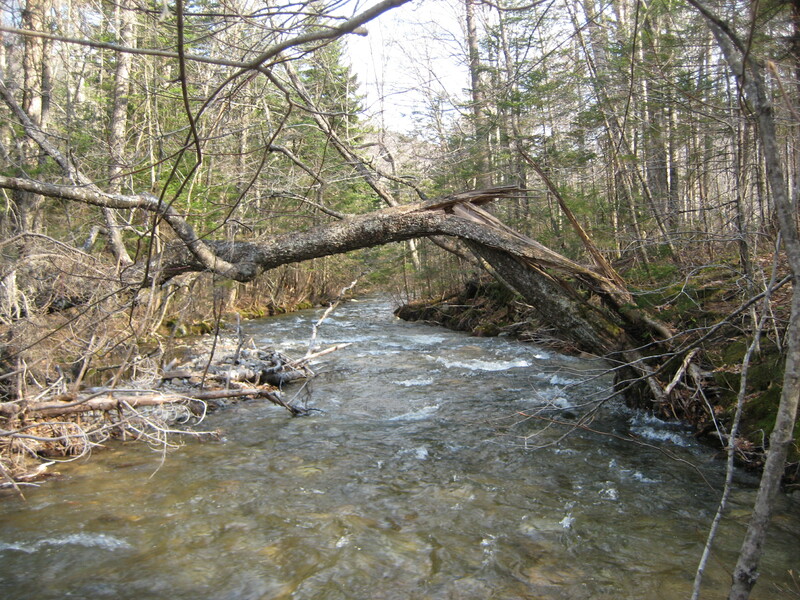 I came upon a cairn indicating a water crossing at some point along my bushwhack, although I couldn’t see any semblance of an official trail on the side of the brook that I was following. After about a mile, the Basin-Cascade Trail joins up with the Cascade Brook Trail, which is part of the Appalachian Trail. The trail then crosses back over the brook at Rocky Glen Falls. There was once a bridge to get across the falls, but it was washed out several years ago. I was glad to see Rocky Glen Falls and the remnants of the bridge at the end of my bushwhack, knowing that the Cascade Brook Trail would only be a few feet ahead. This is all that’s left of the bridge that once traversed Cascade Brook at Rocky Glen Falls, before it was washed out by the brook. Glad I didn’t have to attempt a water crossing here. I bare-booted to Lonesome Lake, but put my gaiters on at some point because I kept post-holing. Still a fair amount of snow up here. 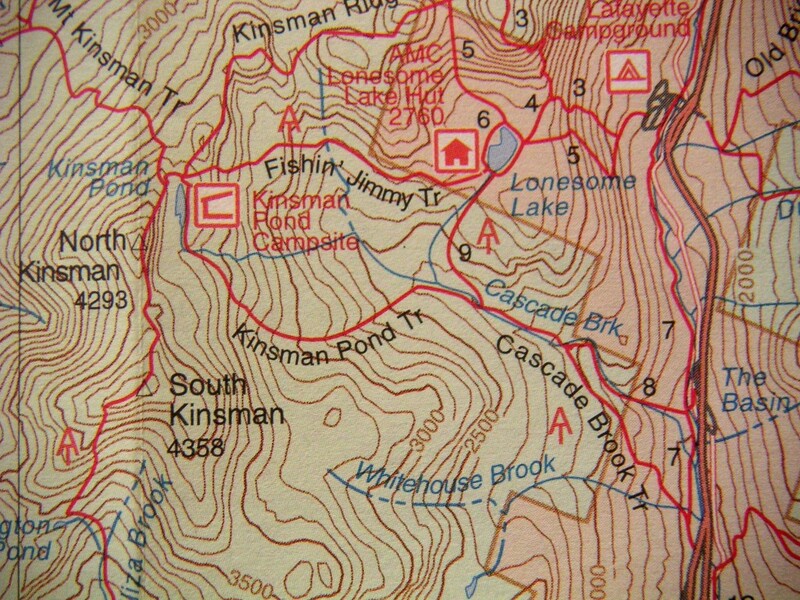 Trail junction with Kinsman Pond Trail, which heads up to Kinsman Pond shelter. Finally I arrived at Lonesome Lake. First view of Cannon Mountain as I emerged from the trees. I stayed at the lake for about two hours, chatting with Becky, an AMC hut and tentsite caretaker, who had been working at the Lonesome Lake hut since January. We basked in the sun and enjoyed the crystal clear view of Franconia Ridge as she shared stories about shoveling snow all day to keep warm during -30 degree days at the hut, and fending off bears during her time working at Garfield tentsite. Franconia Ridge from Lonesome Lake. This picture doesn’t do the view justice, but I was too busy enjoying the view and the company and forgot to take a better pic. You’ll have to come up and see it for yourself! I descended via the Lonesome Lake trail, which was a highway of hard-packed monorail snow for the first half. 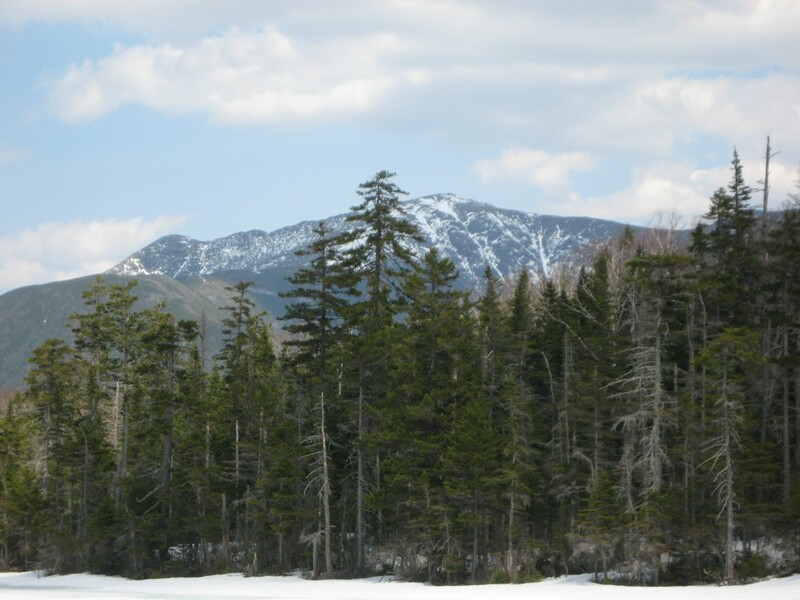 Many great views of Franconia Ridge through the trees. Soon I arrived at Lafayette Campground. From the campground, I took the Pemi Trail to get back to my car at the Basin lot. 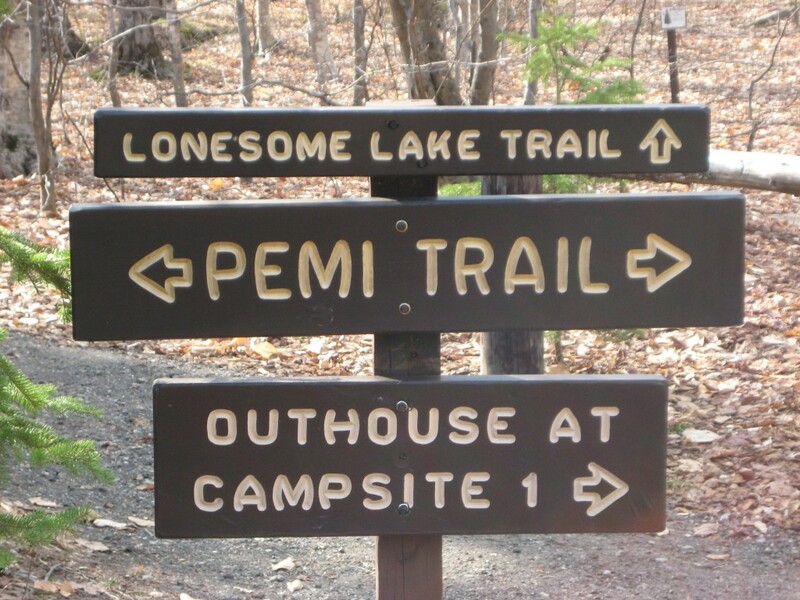 The Pemi Trail parallels the Pemi River (and Rt. 93) and is a good way to get back to your car from various points along Franconia Notch. 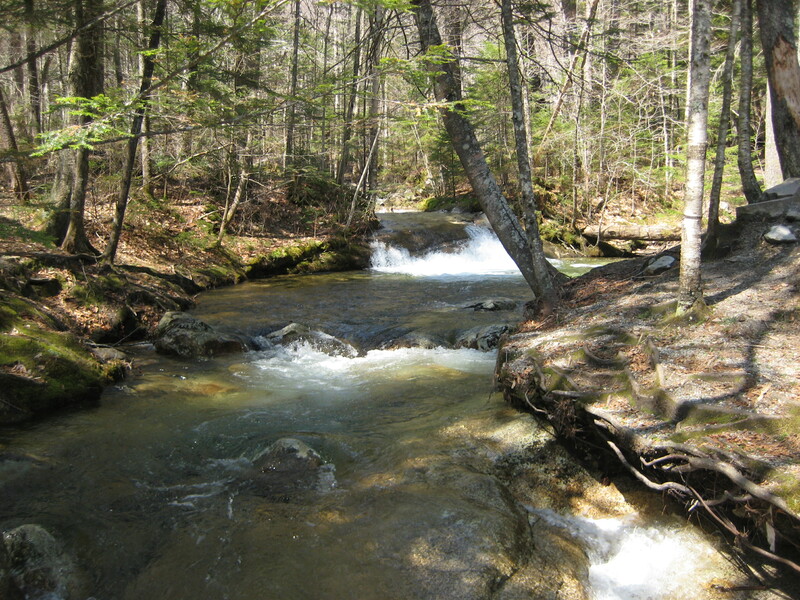 The Pemi Trail itself is worth a visit, if you like rivers. 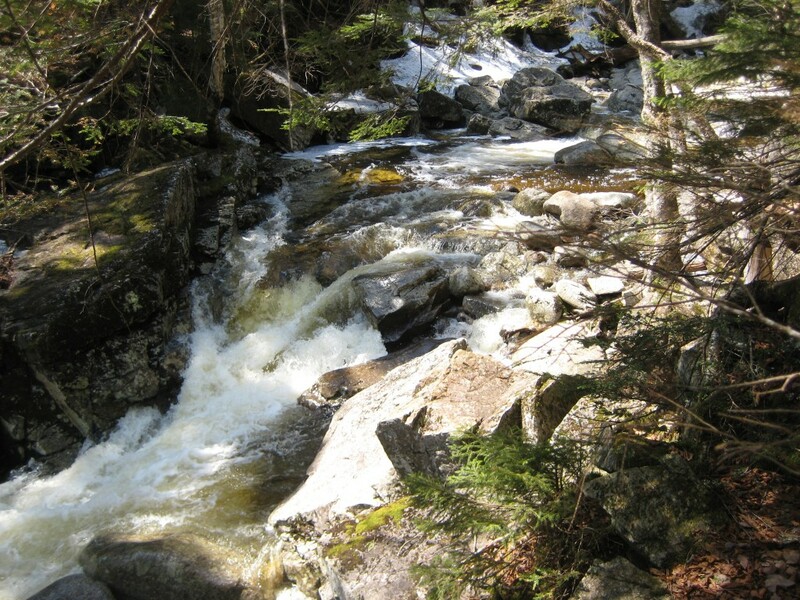 It follows the Pemigewasset River for several miles through Franconia Notch, and connects many parking lots and attractions. On the opposite side of the river is a bike path, for those on two wheels. There’s no shortage of adventures in the Notch! 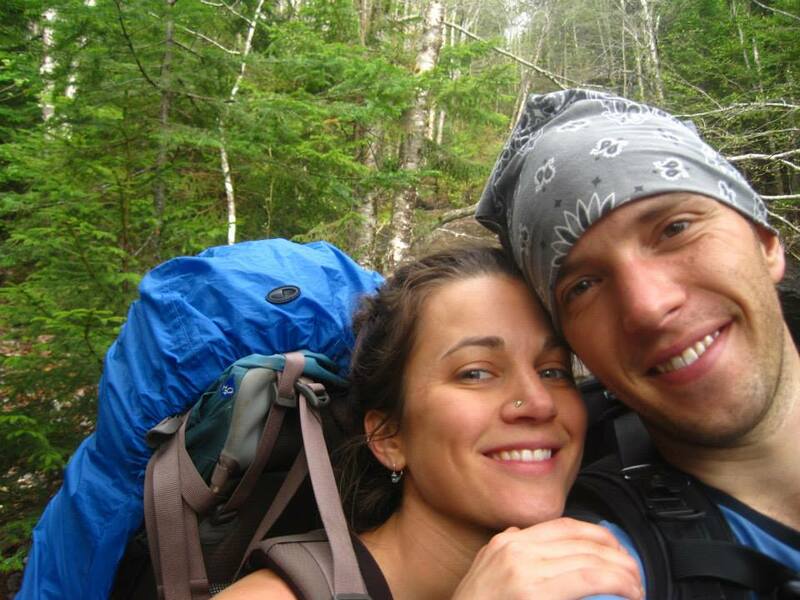 If you’re looking for a hike near the Notch Hostel see #RecommendedHikes in our blog. Not all hikes posted in our Trip Reports section are suitable for everyone.